“Oops, your important files are encrypted” is what the victims of the Wanna Decryptor WannaCry virus see after their computers are infected by this virus. Once this has happened, the ransomware infection begins to append encryption algorithms and make the documents on the affected computers no longer readable. After this has happened, !Please Read Me!.txt file is dropped onto the computer of the user which aims to get victims to download a decryptor from a dropbox account. Then, the decryptor demands 300$ in BTC payoff to get the data back. In case you have become a victim of the Wanna Decryptor threat, we recommend reading this article carefully. Update June 2017! New ransomware outbreak inspired by the WannaCry ransomware, also using “Oops your important files have been encrypted” has been detected. The virus is a modified version of Petya ransomware. More information can be found on this web link. Short Description The malware encrypts users files using AES and RSA encryption ciphers, making direct decryption possible only via a unique decryption key available to the cyber-criminals. Symptoms The user may witness ransom notes and “instructions”, called !Please Read Me!.txt linking to contacting the cyber-criminals. Changes wallpaper with message asking to download a decryptor from Dropbox. The decryptor demands 300$ in BTC to work. User Experience Join our forum to Discuss Wanna Decryptor. A pre-set list of e-mail addresses to spam, usually bought on the black market. Software responsible for different obfuscation of files so that detection by security software is avoided. Malicious command and control servers and distribution hosts. 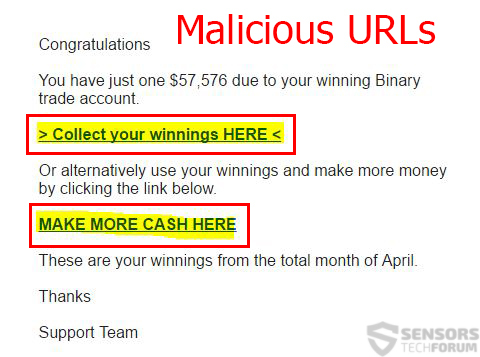 Wanna Decryptor Ransomware – What Does It Do? Wanna Decryptor virus also performs the deletion In /quiet mode, without the user noticing anything is happening. If you see this text, but don’t see the “Wanna Decryptor” window, then your antivirus removed the decrypt software or you deleted it from your computer. Run “Wanna Decryptor” to decrypt your files! The decryption software demands 300$ in BitCoin to be paid to decode the files. For the encryption process performed by Wanna Decryptor, two powerful encryption algorithms may be used. One of them is known as the Advanced Encryption Standard and is a very often met decryptor in most ransomware viruses. The cipher is also used by some US government agencies to encrypt secret documents. It’s usage in this virus is primarily focused on encrypting files and generating symmetric key (FEK) which makes the file non readable. Then, another encryption algorithm, known as Rivest-Shamir-Adleman or RSA is used to generate a Public key corresponding to the symmetric key and adds the key in the file’s data. Since Wanna Decryptor ransomware may use unique keys for set of files or for every file, discovering a decryption method by reverse engineering it can only be successful if there is a mistake while coding the encryption procedure, which is not likely. After the process of encryption is complete, the virus may correspond with the cyber-criminals to send the decryption keys to them, so that they can update their decryptor in the dropbox site. Another scenario is if they have a master decryption key embedded within the decryptor. Whatever the case may be with Wanna Decryptor, experts recommend to remove this virus instead of paying the ransom. For the removal of this virus, advices are to first back up the encrypted files and then follow the removal instructions below. They are specifically created to help delete the malicious files and objects created by this ransomware on your computer. In case manual removal is a challenge for you, recommendations are to focus on automatically removing everything related to Wanna Decryptor ransomware. Experts advise that the best way of doing the removal is by downloading an advanced anti-malware tool which will not only delete all files but will also protect your computer against future infections. If you want to try and restore the files encrypted by Wanna Decryptor, we have suggested some methods in step “2. Restore files encrypted by Wanna Decryptor” below. They are not 100% guarantee you will get all the files back, but you may recover at least some of the data using these methods. Threats such as Wanna Decryptor may be persistent. They tend to re-appear if not fully deleted. A malware removal tool like Combo Cleaner will help you to remove malicious programs, saving you the time and the struggle of tracking down numerous malicious files. Threats such as Wanna Decryptor may be persistent on your system. They tend to re-appear if not fully deleted. A malware removal tool like SpyHunter will help you to remove malicious programs, saving you the time and the struggle of tracking down numerous malicious files. Note! Your computer system may be affected by Wanna Decryptor and other threats. SpyHunter is a powerful malware removal tool designed to help users with in-depth system security analysis, detection and removal of threats such as Wanna Decryptor. 1. Install SpyHunter to scan for Wanna Decryptor and remove them. 2. Scan with SpyHunter, Detect and Remove Wanna Decryptor. Ransomware infections and Wanna Decryptor aim to encrypt your files using an encryption algorithm which may be very difficult to decrypt. This is why we have suggested several alternative methods that may help you go around direct decryption and try to restore your files. Bear in mind that these methods may not be 100% effective but may also help you a little or a lot in different situations. Note! Your computer system may be affected by Wanna Decryptor or other threats. Remove Wanna Decryptor by cleaning your Browser and Registry. Fix registry entries created by Wanna Decryptor on your PC. Combo Cleaner is a powerful malware removal tool designed to help users with in-depth system security analysis, detection and removal of threats such as Wanna Decryptor. Step 5: In the Applications menu, look for any suspicious app or an app with a name, similar or identical to Wanna Decryptor. If you find it, right-click on the app and select “Move to Trash”. Step 6: Select Accounts, after which click on the Login Items preference. Your Mac will then show you a list of items that start automatically when you log in. Look for any suspicious apps identical or similar to Wanna Decryptor. Check the app you want to stop from running automatically and then select on the Minus (“–“) icon to hide it. Remove Wanna Decryptor – related extensions from your Mac’s browsers. A pop-up window will appear asking for confirmation to uninstall the extension. Select ‘Uninstall’ again, and the Wanna Decryptor will be removed. When you are facing problems on your Mac as a result of unwanted scripts and programs such as Wanna Decryptor, the recommended way of eliminating the threat is by using an anti-malware program. Combo Cleaner offers advanced security features along with other modules that will improve your Mac’s security and protect it in the future. Hey !, I found this information for you: "Wanna Decryptor (WannaCry) Ransomware (Restore Files)". 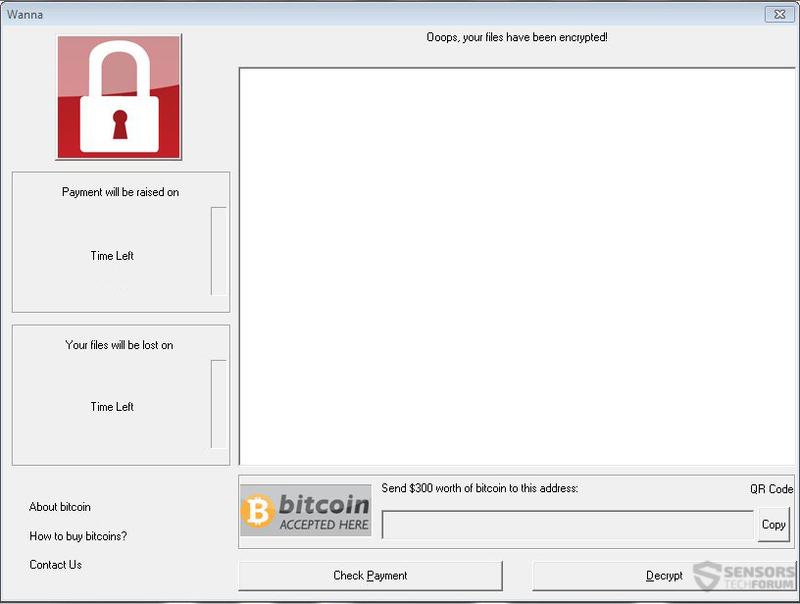 Here is the website link: https://sensorstechforum.com/wanna-decryptor-wannacry-ransomware-restore-files/. Thank you.